1. 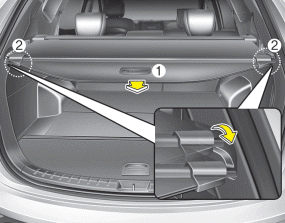 Pull the cargo security screen towards the rear of the vehicle by the handle (1). 2. Insert the guide pin into the guide (2). Pull out the cargo security screen with the handle in the center to prevent the guide pin from falling out of the guide. 1. Pull the cargo security screen backward and up to release it from the guides. 2. The cargo security screen will automatically slide back in. The cargo security screen may not automatically slide back in if the cargo security screen is not fully pulled out. Fully pull it out and then let go.